Planning for this event to be held in the Canberra region from 21-23 September is in full swing, with venues for registration and the display day sorted, all we need now from you and your members is a commitment to come. We have had a great response to our first email but it's time to get serious, obviously, we want to have sufficient numbers to warrant proceeding further with confirming venues and ordering items like grille badges. That said, we have not yet reached a critical mass to make the rally viable. ~ If you are thinking of coming you need to let us know. September is an ideal month to visit Canberra and its surrounding region, not only is the weather becoming warmer, it coincides with Floriade, the month-long annual flower show on the Lake Burley Griffin shores and which is a colourful additional reason to come and see us. Events will be centred on Queanbeyan, just a stone's throw from Canberra, with registrations on the Friday at the hillclimb circuit and a keep-the-date booking on leafy Queanbeyan Park just adjacent to Queanbeyan’s CBD for the display day on Saturday. Once we have an idea of numbers we will seek local dining venues with the capacity to feed the hungry hordes. Sunday will be the main day for participants to take one of the self-guided tours around the region and the national institutions like Parliament House. The program will include a number of pay-as-you-go functions in local venues. Talking of Parliament, Parliament is sitting in the week before the rally but you’ll need to arrive before 20 September to see it in full flight, Question Time at 2 pm in the House of Reps is always fun, or you can see an almost similar spectacle in the Senate! We think these arrangements allow maximum flexibility for individuals and groups to tailor their participation in the rally. Club representatives who have not yet responded need to do so by 11 March to morrisminorclubsnationalrally@gmail.com with numbers of cars and people to indicate your interest in participating. This will enable us to budget and set a reasonable entry price. If individuals within clubs would like to be added to our distribution list in order to receive updates directly than please send through e-mail addresses. Future bulletins will give further details about the venues and the program, as well as giving some guidance about how and where to book. Thanks, this is the first indication of what's being planned for the weekend. The NSW club doesn't have another general meeting until April & even if an email was sent out to the members (not all of which have it), I really doubt they'd be sufficient response to guesstimate numbers attending between now & next weekend. Now that I know the display day is Saturday, I'll definitely come down for the day. Ideally I'd like to come down Friday night but I can't see that happening. Thanks to all those people who have enthusiastically embraced the concept of a September rally. Just a reminder of the rally dates – 21-23 September 2018. Last month’s bulletin had some valuable information about preliminary arrangements for the rally. Please PM me for an entry form. The sooner you lodge it, the sooner we can include you in the emailed updates. In any case, entries should be lodged and registration paid by 20 July. Down to some detail about the program. Registrations and activities at the region’s hill climb circuit on Friday. Apart from getting a first glimpse of some of the great cars that will be gracing the Canberra region, we’ll have a number of competitions to keep you busy. We’ll be celebrating the best of the modern Morris Minors from clubs around Australia. There’s a pic of a section of the venue, Queanbeyan Park, below. It’s handy to Queanbeyan’s town centre for shopaholics and youngsters will also be well catered for with the local council opening a great new playground in the park. We’re planning to build the collegial theme with displays in club groupings. And speeches and formalities will be at a minimum, with an entrants’ choice trophy, selected by people registered for the rally, and a limited number of other perpetual trophies. There will be no concours judging. We’ll celebrate the 70 year anniversary of the production of the first modern Morris Minor at dinner that night. More details in future emails. We’re planning a range of tour cruises that take in the best of what the region offers, with opportunities to lunch at some affordable eateries en-route and meeting back at the Sutton Road hill-climb centre for a final hurrah! And we are still open to suggestions if you would like to visit specific places in and around Canberra but you’d better be quick. One destination that will likely be on the itinerary will be the National Arboretum, which is well worth a cruise around for its wonderful views of the national capital from a fresh angle. Of course, you will be able to visit Mount Ainslie to view the triangular layout proposed by Burley Griffin for the national capital and enjoy the vista from the futuristic Black Mountain tower but accessing these in a standard MM may be a little bit of a challenge. We are keen to locate all perpetual trophies being held by recipients from previous years so we can discuss arrangements to have them returned in time. 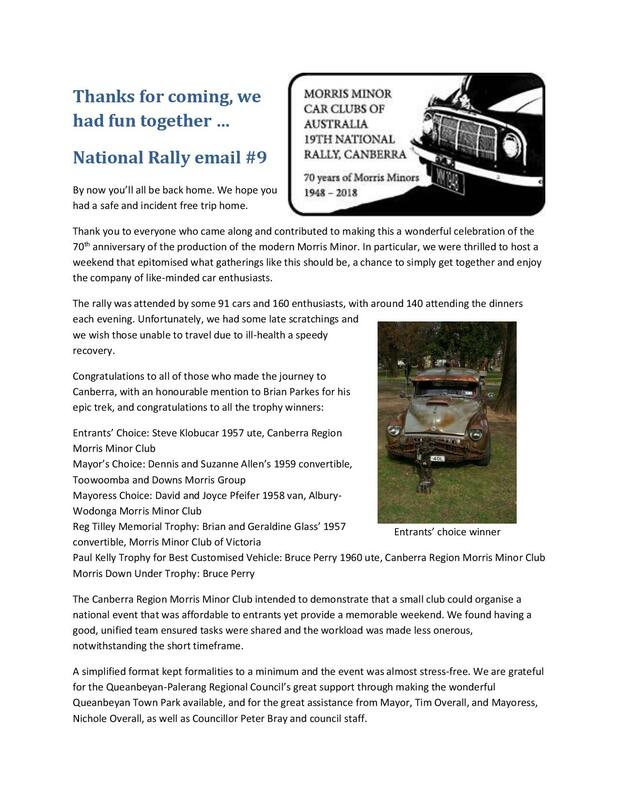 Saturday’s proceedings at Queanbeyan Park will conclude with a brief meeting of club delegates, the main agenda item being the hosting, timing and location of the next Morris Minor Clubs of Australia National Rally. But it will also have the opportunity for other matters with due notice from clubs. To enable agenda items to be circulated for proper consideration by clubs, they should be forwarded to this email address by no later than 25 June 2018. Keep your eyes out for Next month’s message for the latest news on your rally. The registrations are rolling in, so get yours in. See you in Canberra in September! National Rally email#6 is attached below. Hot off the press, email update #7 Things are really coming together! Well, with around eight weeks to go planning for the 21-23 September weekend is pretty firm now. So we thought we’d drop a few teasers in this update, without giving too much away, because we don’t want to spoil the surprises. If you're travelling to the rally, drive safely, we'll see you here in under three weeks. Please read the two (2) attachments and respond with your choice of Sunday tour. We’ve been telling you that just staying for the rally then bolting isn’t long enough to get more than a taste of Canberra. Here are four tours that tell you why. Instead of one cruise around the capital, we’ve decided to break things up and give you four themed drives that will take in some of our best sights and sites. Please let us know which tour you plan to take on Sunday so we can flag numbers with some of the venues, email us on morrisminorclubsnationalrally@gmail.com as soon as possible. That will ensure each venue is able to cope with an influx of 20 or 30 MMs and passengers looking for something to eat! to take a Segway ride during the Different Look at Canberra tour: numbers are limited and they need to be pre-booked, so let us know as soon as you can.